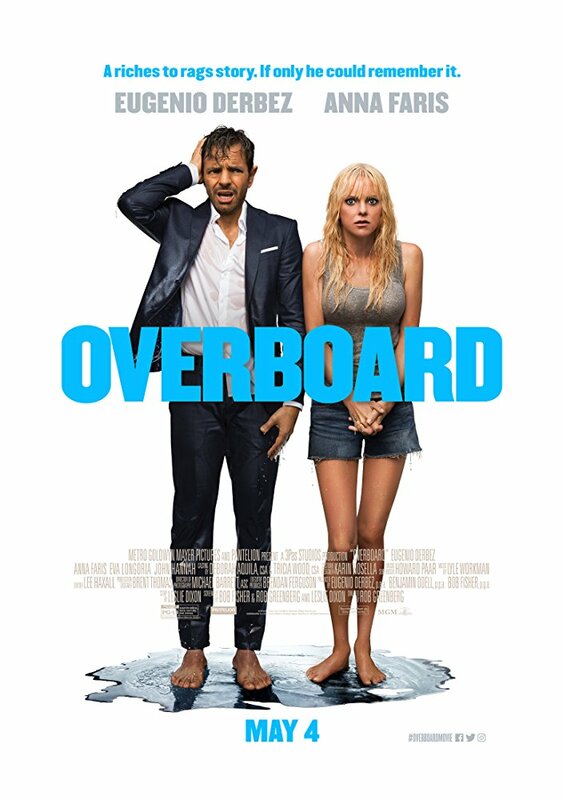 Better than you might expect while just as easily forgettable, Overboard seeks to reinvent a formula that never went stale or got old, and for that reason comes across as a blasé and bloated attempt to breathe new life into a body that never really drowned in the first place. It’s not terrible. It’s not great. Its antics are watchable – at times even enjoyable – although its purpose for existing is indeterminable. Overboard goes on way longer than it should, and even then, never really justifies its purpose or its place in this world. It’s just…there, for us to see and to quickly move on from. Three daughters, two jobs, and one impossible nursing exam keeps the Seattleite Kate (Anna Faris) skating along the poverty line of single parenthood. She delivers pizzas for her friend Theresa (Eva Longoria). When not in a premium rush mode, she cleans carpets on the side. This brings her across Leonardo Montenegro (Eugenio Derbez), a billionaire Lothario who guzzles down the drink and imbibes in fake affection from his rotating stable of one-night stand victims. Leonardo treats Kate like an object, critiquing her appearance, justifying her femininity through his fleeting desire to take her to bed. Kate loses her job…Leo loses his footing…they eventually find each other in the hospital as Kate convinces this new amnesiac that he is her husband. Overboard pretty much wastes its open by creating sketches of people instead of detailed portraits, yet you can’t deny its occasional rough-around-the-edges appeal. The stunt works in spurts and in spades. A tie-in to the memorable 1987 picture starring Kurt Russell and Goldie Hawn comes with a sly, knowing wink, and from there the film pretty much follows the exact same trajectory. There are almost no surprises in Overboard if you’ve seen the original. Efforts have been made to spruce up this lot, though, or at the very least change the scenery a bit. The gender swap between the leads is a nice twist, as is the inclusion of Derbez as a leading man. Latinos hardly ever get to play a love interest in mainstream films, and by including plenty of integral Spanish-speaking characters, the movie champions a changing landscape in the voice of America. This enthusiastic and welcome approach is only halted by the flat-footed, simpleton style of a story doing its telling. As ticket prices continue to skyrocket and the cost of a good date night with dinner and a movie spirals out of control, I can’t bring myself to recommend Overboard and tell you to go see this film in theaters. Intentionally scripted like a Spanish language daytime soap opera that’s evolved into an on-demand flick, the movie is more of a regurgitation than it is a reinvention. This time around, Overboard decides to play it cool and coy, even though the original film was a success because it embraced all of the great exaggerations of its crazy, politically incorrect and Stockholm syndrome inspired story. When comparing the two, and despite its many efforts, this dive Overboard just doesn’t measure up to its predecessor’s earned reputation as a long-lost treasure. Take the leap if you must – just don’t expect to find a convenient buoy ready to reel you back into the safety of reality.